The Climate Model Development and Validation (CMDV) – Mesoscale Convective System (MCS) is a project titled "Use of Remote Sensing and In-Situ Observations to Develop and Evaluate Improved Representations of Convection and Clouds for the ACME Model," sponsored by the U.S. Department of Energy’s (DOE’s) Office of Biological and Environmental Research (BER) to develop and validate the DOE’s Accelerated Climate Model for Energy (ACME) model capability in simulating MCSs. MCSs are one of the most climatically significant forms of convection. They influence the climate system through (1) releasing latent heat that drives the general circulation, (2) providing the dominant source of precipitation in many regions, (3) redistributing and removing water, clouds, and aerosol, and (4) affecting the transfer of radiation through the atmosphere. parameterization developments based on observations over the central U.S. will contribute to improving the simulated climate elsewhere. microphysical treatments based on both bulk and bin approaches. Strategy to improve cloud parameterizations and evaluate the Accelerated Climate Modeling for Energy (ACME) model by using various observations and Limited-Area Modeling (LAM) and large eddy simulations (LES). Evaluation of parameterizations is through ACME regionally-refined grid centered over the ARM Southern Great Plains (SGP) site. Additional global observational data will be used to evaluate the performance of ACME simulations with a uniform grid at selected resolutions. During our project, we will use cases chosen from the Midlatitude Continental Convective Clouds Experiment (MC3E) and the Plains Elevated Convection at Night (PECAN) for detailed analyses of MCS lifecycles. LES and LAM studies of selected cases will be carried out over the region to improve understanding of MCS features and serve as benchmarks guiding parameterization development and to assess ACME model simulations. act as a vehicle to implement new (or improve existing) formulations. Model simulations will be carried out and evaluated with month-long observations of MC3E, long-term statistics of MCS features at the ARM SGP site, and satellite active sensors (TRMM/GPM, CloudSat, and CALIPSO). To more accurately and quantitatively evaluate model simulations, instrumental simulators for ground-based and space radars and lidars will be developed and used to compare model outputs with observations. When assessment of the new parameterizations for the continental USA (and SGP) region suggests improvement, the ACME model will be configured to explore the consequences for global simulations (e.g., MJO, ITCZ, ENSO, monsoons) at different grid-spacings using a uniform grid. 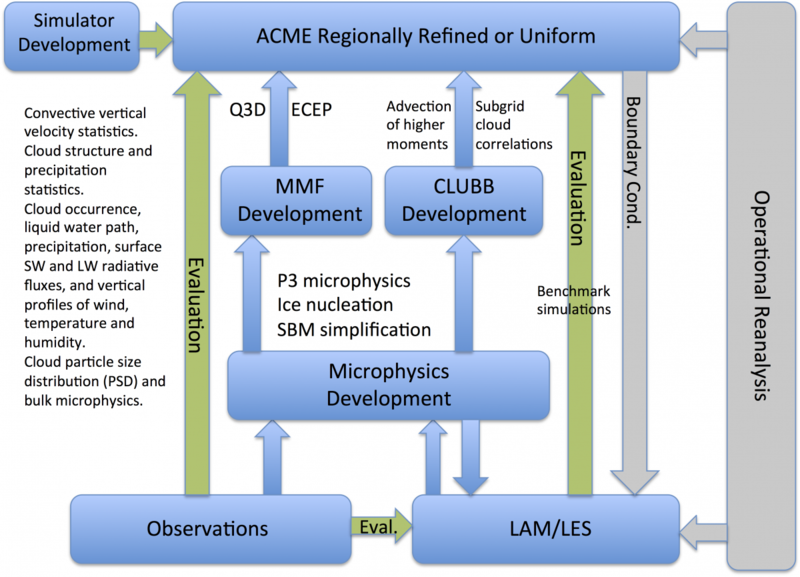 a version of the ACME model that can better predict meso-scale phenomena. The proposed research would produce a large impact on the paradigm of climate modeling evaluation by providing a framework that uses comprehensive observational datasets at different scales to understand climate-related processes and evaluate representations of those processes in state-of-art climate models. The project spans a 3-year period from FY2017-2019, with a collaboration team consisting of three national labs (PNNL, BNL, and SNL) and four universities (Colorado State U., U. Arizona, U. Wisconsin-Milwaukee, and U. Wyoming).